Sources within village hall claim that Bolingbrook will host its own college bowl game starting in 2012. Steve, a source close to Mayor Roger Claar, says Claar is very excited about the proposed bowl game. “He said, ‘Steve, we haven’t been certified by the NCAA, and corporations are already lining up to give us money! If we manage our expenses right, this bowl game could pay off the golf club and Americana Estates.’” It would also be a big boon for local businesses, Steve claims Roger told him. Because local restaurants could run the concession stands, and then fans could shop at the Promenade while waiting for the traffic to clear up. According to Steve, the bowl game, which has been in the planning stages since 2002, was originally called The Bolingbrook Bowl. Its name then evolved into The Bolingbrook Promenade Bowl on Molex Field with the Ikea and Meijer End Zones Inside Orange Crush Stadium. Steve added, that bowl game almost didn’t happen when Claar said that he wanted his name included the official bowl game name. The board of directors said that Claar should pay, like the other corporations did. So the game was renamed to Roger Claar Presents The Bolingbrook Promenade Bowl on Molex Field with the Ikea and Meijer End Zones Inside Orange Crush Stadium in honor of Heart Haven Outreach. Claar then made what Steve called, “A small donation” to the board of directors. 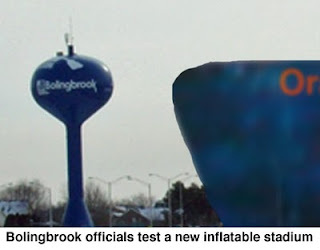 The second obstacle to the bowl game was Bolingbrook’s lack of a large stadium. The solution presented itself last month, according to various sources. Chicago Mayor Daley offered to sell an inflatable domed stadium. Intended a temporary structure for the 2016 Olympic games, the stadium had a large tear and he didn’t want pay to patch it up. The village was planning to announce the bowl game in 2011, but will have to move up the announcement due to an article on The Number Cruncher’s web site. The sources say that the village’s share of the bowl game’s expense was disguised as a “Culture and Recreation” line item. Homoeopath claims to be able to reverse vaccines. Chicago scientist sees return of glaciers in one month! Asian Land Carp spotted in Homewood!